Voh Kee, Chang Sung and Dah Cheng were three Shanghainese builders which set up shop in Hong Kong between 1945 and 1949 and remained active in the local construction scene during the 1950s. All three firms have since faded away from the HK construction industry. 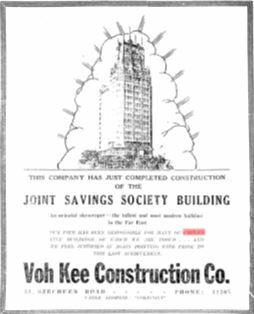 Regarded by one publication as “China’s Foremost Constructor”, Voh Kee & Co (馥記營造廠) was one of the largest construction firms in Republican China and its founder Quer-Ling Dao (陶桂林, 1892-1992, hereafter refer to as “Q.L. Dao”) was a well-respected leader in the Asian construction industry. A native of Qidong in Jiangsu province and coming from a family of fishermen, QL started working at the age of 12 as a woodworking apprentice in Shanghai and later entered the construction industry working for American and Chinese firms while studying English at night schools. In 1922, he founded Voh Kee and very quickly made a name for himself with high profile projects such as the Sun Yat-sen Mausoleum in Nanking and Sun Yat-sen Memorial Hall in Canton. The firm reached its zenith in the 1930s when it employed almost 20,000 workers at one point and in 1934 completed the 24 story Joint Savings Society Building (which also housed the Park Hotel) in Shanghai, the tallest building in the Far East within 22 months. Voh Kee built commercial and government buildings, dockyards, piers and bridges all across China and had branches in Nanking, Canton, Tsingtao, Chungking, Lanchow, Nanchang and Kweichow where it was responsible for the construction of many landmark buildings, working in conjunction with famous architects such as Laszlo Hudec, Sung-sing Kwan and Robert Fan. During the War it moved with the KMT regime to Chungking where it completed many important projects. After the War, Q.L. Dao was eager to participate in the reconstruction effort and resumed Voh Kee’s operations across the country. In 1946, Voh Kee Construction (HK) Ltd was incorporated in Hong Kong to take on construction projects in the colony. 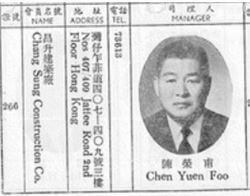 According to a 1949 HK company directory, Voh Kee Construction (HK) operated out of the Jardine compound in East Point and its board comprised of Sir Man-kam Lo (chairman), E. Watts, Dr. Francis Pan (KMT transportation official, later founder of CUHK Press and HK Eye Bank), Richard Lee, H.Y. Hsu (MIT graduate, Jardine executive), Carl Wu, T.S. Wong, T. C. Chao and Peter Ling. The operation was managed by V.K. Lee who was assisted by F.L. Yang and Albert Loo and also included a godown department managed by Lionel Lowe. In 1948, Q.L. Dao visited HK as chairman of the Chinese National Association of General Contractors which he had founded a year earlier and was made honorary chairman of the HK Kiangsu Chekiang Construction Association by its founders YL Nie, TL Zee (see Shanghainese Builders Part One, linked below) and KQ Wong (see the entry below about Dah Cheng). The next year, he moved with the KMT regime to Taiwan where Voh Kee worked on important projects such as the Songshan Airport in Taipei. Although Voh Kee HK was dissolved in 1955 (the same year that QL became a permanent resident of the United States), Q.L. 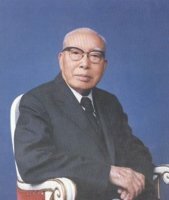 Dao maintained a cordial relationship with the HK construction industry and when he visited HK in 1960 as chairman of the pan-Asian trade association, he was welcomed by the members of the HK Building Contractors Association. 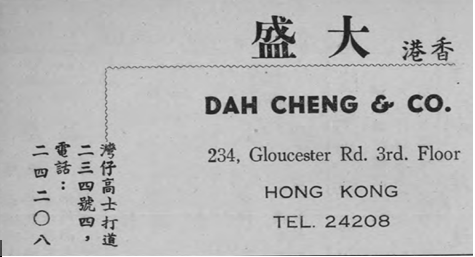 In 1973 after the 50th anniversary of Voh Kee, the 81 year old Dao retired and moved to Los Angeles for good and his son Raymond CF Dao (陶錦藩) succeeded him as head of the firm. A father of 6 sons and 3 daughters, QL passed away in LA in 1992 at the age of 100. One of the most active Shanghainese contractors in Hong Kong during the 1940s and 1950s was Chang Sung. Founded by S.N. Chiang (姜锡年, 1897-1963) in Shanghai, the firm’s extension to HK was also driven by client demand similar to Dao Kee. A native of Shanghai, Chiang started in the construction industry as a teenager and was the second student of P.H. Zia (谢秉衡) at the leading Chinese building contractor Yu Chong Tai (裕昌泰). He went to high school at night where he learned English and eventually rose to become deputy manager of Yu Chong Tai and was responsible for many important projects on the Bund. Chiang later struck out on his own and co-founded Chang Sung Construction with his colleague Wei-ming Sun (孙维明). His two key clients were the industrialist O.S. Lieu and British American Tobacco (BAT), whom he became a major contractor for through friendship with Arnold Aeschbach, managing director of the Swiss engineering firm C. Luthy & Co (罗德洋行) and soon Chang Sun’s business was nationwide, involved in projects as distant as Liaoning. During the War, the BAT taipans were interned by the Japanese in the Lunghwa concentration camp and Chiang visited and provided for them. This wartime act of kindness paid off after the War and when BAT needed a contractor to build a six storey godown at 256 Gloucester Road (later re-developed into Sino Plaza) in Hong Kong in September 1948, Chang Sung got the job which helped pave the way for the firm’s eventual move to HK. As there were 5 major projects in Shanghai, Chiang returned to the mainland and left his junior partner Chen Yuen-foo (陳榮甫, 1912-1960) in charge of the HK business. Chen had joined the firm in Shanghai at the age of 16 as an apprentice and during the War was responsible for construction projects on the Burma Road and was stranded in HK during the Japanese occupation for a year. 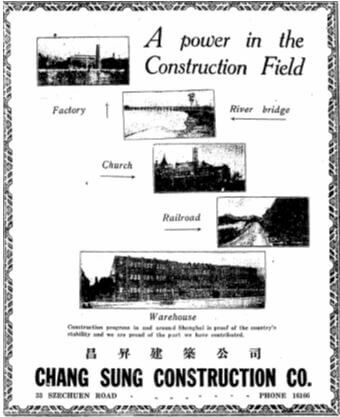 After the Communists took over Chiang was initially enthusiastic about the new regime and led the formation of New Life United Construction (新生联合营造厂) with a number of prominent Shanghainese builders, which completed a number of large scale construction projects (textile mills and water plants) in the interior provinces such as Xinjiang and Shanxi. In HK, Chen proved to be capable manager and in the early 1950s managed to secure the business of building electrical stations and substations and three blocks of staff quarters for HK Electric in addition to the Dodwell Mansion on the Peak and Shatin Heights Hotel. Chiang was purged in the Three Anti Five Anti campaigns in 1951-52 so he moved to Hong Kong with his sons. Sadly, YF Chen, a member of the Rotary Club of HK East who loved to drink, died in 1960 at the age of 48 and Chiang himself also died three years later in 1963. Three of Chiang’s sons were in the construction business, the most prominent of whom was Y.Y. 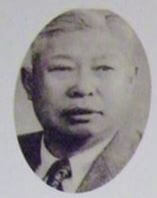 Chiang (姜誾如), who was one of the founding members of the Real Estate Developers Association of Hong Kong (one of the few who were Shanghainese). In 1961, the firm was incorporated as Chang Sung Construction & Investment Co Ltd, and then renamed Chang Sung (Kong Kee) Construction Co Ltd (昌升(港記)建築有限公司) the next year. It was dissolved in 1995. Dah Cheng was founded by Wong King-Quai (黃金魁). Born in 1902, Wong moved from Shanghai to Hong Kong. In 1948 he was one of the directors of the Shanghainese builders group formed by Y.L. Nie of Yaik Sang and others. In 1957, it won the contract to build the Kiangsu Chekiang School building in North Point (designed by architect Chau Iu Nin) with the lowest bid amongst 15 bidders for the amount of $1.33 mil. Wong further reduced the bid by $20,000. In February 1961 right before Chinese New Year, Wong disappeared after visiting the office of Tai Hing Cotton Mills in Yu To Sang House in Central. A week later his family reported to the police, who at first did not rule out the possibility of kidnapping since another prominent businessman, the former Standard Oil comprador and banker Wong Sik-Pun and his son Wong Ying-kau were kidnapped around the same time. At the time his firm was handling 3 civil servant quarters in Blue Pool Road, Jardine’s Lookout and Hunghom worth a total of $1 mil and since he was a sole proprietor, his business operations were immediately suspended. Rumors spread that he went back to Shanghai but later police found him to have gone to Macau. After a month Wong returned from Macau and business resumed. The firm’s name still appeared in the 1968 Hong Kong Almanac published by Wah Kiu Yat Po. This article was first posted on 10th February 2017.